MLM Matrix Plan also known as ladder Plan or Forced Matrix Plan in Multi-level marketing companies which is similar to pyramid. Members which are organized in a particular width and depth are compensated when they achieve a set level. 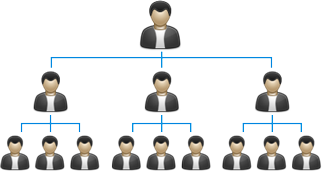 The MLM Company can set structure for members to qualify a particular level that may be 3 in width and 5 in depth. In other words a distributor only can introduce 3 as his front-line and a member can earn compensation up to 5th level. According to Matrix Plan the width is limited therefore; a member can motivate his/ her down line members to earn more profit. A member can allow completing his width up to a limit and the new recruits will positioned under any of your down line in depth. MLM Companies can make more attractive Forced Matrix Plan by increasing the depth for bonuses and compensation; some MLM companies can reduce the width in this regard. We can say the Matrix Plan have potential for new comers as well as old members. MLM Software India has expert team of consultants who are ready to suggest the best Matrix Plan for the company/individual which want to start MLM business and earn huge profit. The development team in MLM Software India has developed many Forced Matrix Plan for various satisfied MLM companies and continuously providing the support to run their MLM business smoothly.